Students may attend the symposium only once, if accepted, and no more than three students from the same school may apply in any particular year. 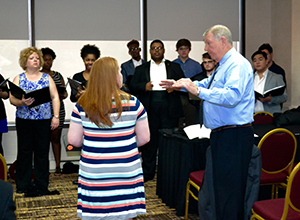 During the three-day symposium, each participant is paired with a NAfME Collegiate student mentor. Mentors accompany students and attend the sessions of the Symposium with them. They also provide valuable information about college and becoming a music major. Each high school student participates in mock college auditions and interviews where university faculty members from several North Carolina institutions provide individualized feedback and support. Each participant also actively engages in a choral or instrumental conducting session by conducting a predetermined piece with a collegiate ensemble. 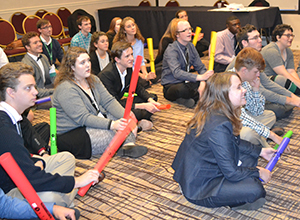 Finally, all participants attend other specialized sessions that encompass a variety of topics, have dinner with a keynote speaker, attend the North Carolina High School Honors Chorus and Honors Orchestra Concerts, and visit booths in the exhibit hall to gather more information about specific music education programs. 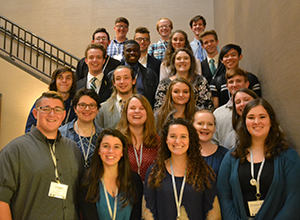 The Young Professionals’ Symposium is a valuable program that exposes and prepares them for the realities of an undergraduate degree program and a subsequent career in music education.